Harriet Scott Chessman. 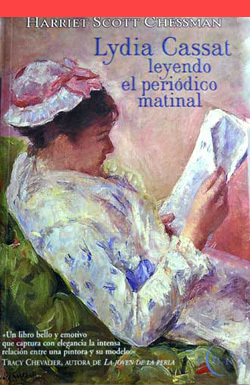 Lydia Cassatt leyendo el periódico matinal. Barcelona: Ediciones B, 2003, 224 pages. Translated by Marta Pino Moreno. ISBN: 9788466610674. Spanish translation of the original title: Harriet Scott Chessman Lydia Cassatt Reading the Morning Paper. Amherst: John Wiley and Sons, 2001. Published in Spanish by Ediciones B.